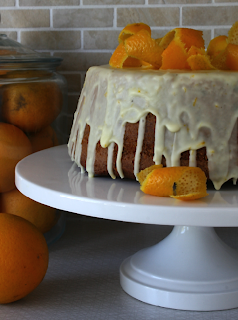 ...And by orange crush, I mean I am in love with this cake. Once again I am trying new ways to use the fruit we have. 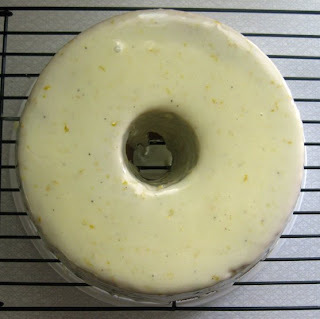 For the past week it has been my plan to make an orange cheesecake, but I wanted something different. 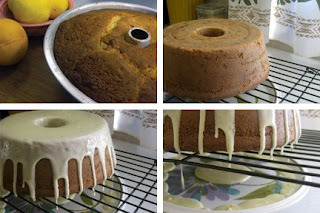 Pound cake sounded good so I set out to find and a recipe for orange one. I used this recipe for Orange-Chocolate Chunk Cake as a base, BUT of course I had to tinker with it. The recipe said to bake for 1 hour, but i found it took almost 2 hours at 350 to get it to cook all the way through. I think the finished cake might weigh 5lbs. I used 1/2 cup milk and 1/4 cup sour cream since I did not have buttermilk and I used plain old Nestle Chocolate chips. 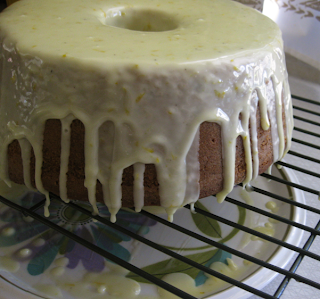 I also opted out of making/pouring the syrup over the cake as listed in the recipe and instead of doing a chocolate ganache I made a glaze icing. 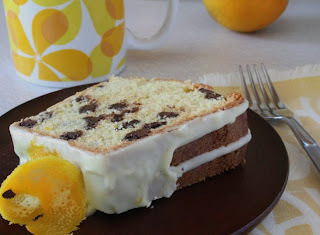 The icing was 1 cup confectioners sugar 3 tablespoons fresh orange juice, 1 teaspoon orange zest and 1 large pinch of black pepper. YES, BLACK PEPPER. 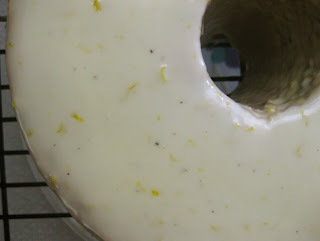 The zest and pepper were really ways of just making the glaze speckled, but the pepper adds a nice,yet subtle flavor. Fresh out of the oven, cooling on a wire rack, with the first round of glazing. Waiting for the 2nd layer of glaze to dry. After the first layer dries, take the drippings from the plate and whisk back together then pour over the top again. Speckled with black pepper and orange zest. did i mention how amazing this cake is? i can't wait to try it with other fruits. just think deb... you'll be here tasting something from the CFC kitchen before you know it. A tear just came to my eye. As if I didn't have enough to daydream about! You are killing me with the food posts. So unfair.. Helllllllllppppppppppppp mmmmeeeeeeeee. James... thanks. sounds good... but i have to say the photo looks like they dropped it! haha. Annie... be warned... there will be MORE!